Germany and the rest of Europe are celebrating the 25th anniversary of the collapse of the Berlin Wall and the associated communist regimes in Eastern Europe. This event had colossal repercussions in the economic development of the region but also, and maybe less obviously, on its demography. 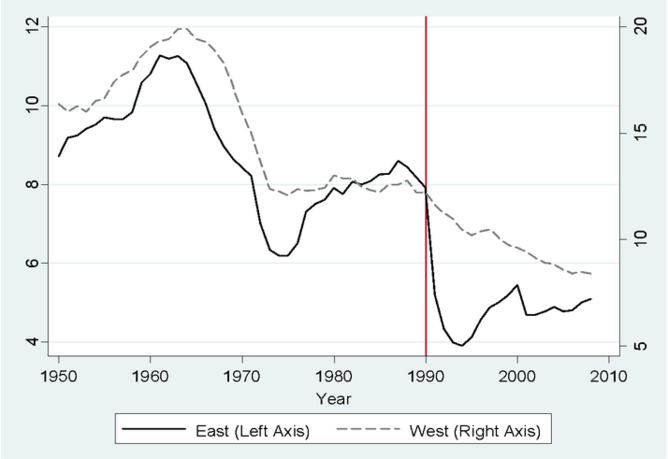 Following the collapse of the Communist regimes, fertility in Eastern Europe went into a sharp decline. This was especially marked in East Germany which over a short period experienced a 50% drop in births (Figure 1) which was dubbed the “most substantial fall in birth rates that ever occurred in peacetime”. 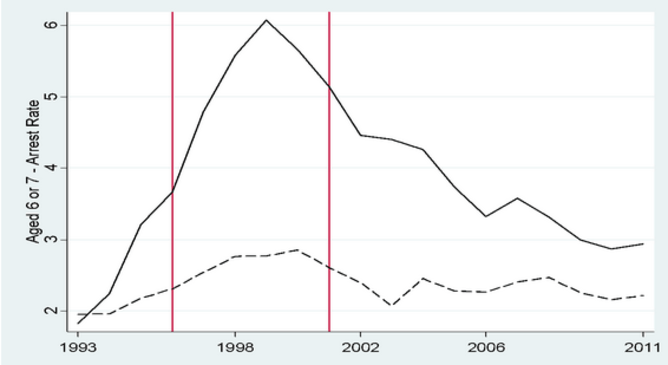 Economic uncertainty was one of the main reasons for the fertility drop. But who were the parents that, despite the distressing level of economic uncertainty, decided to have children? And does this parental selection matter to how their children fare later on? 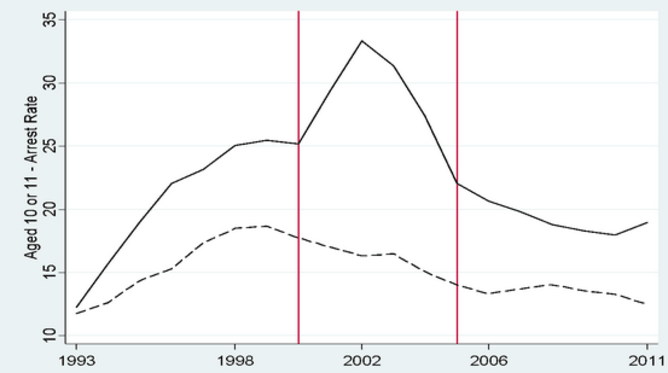 Theoretically, an economic downturn has two opposite effects on the demand for children: it reduces household income (something called the income effect) but it also reduces the opportunity costs of having children (the substitution effect) where the prospects of finding a job are low, and being out of the labour market and raising a child is not as costly in terms of forgone earnings. Which of these effects dominates is ambiguous. In fact, it is likely that the relative size of the substitution and income effect depends on family characteristics, which lead to differences in parental composition throughout the economic cycle. For example, for richer families the income effect is likely to be the more important while for less wealthy ones, the substitution effect is likely to dominate. 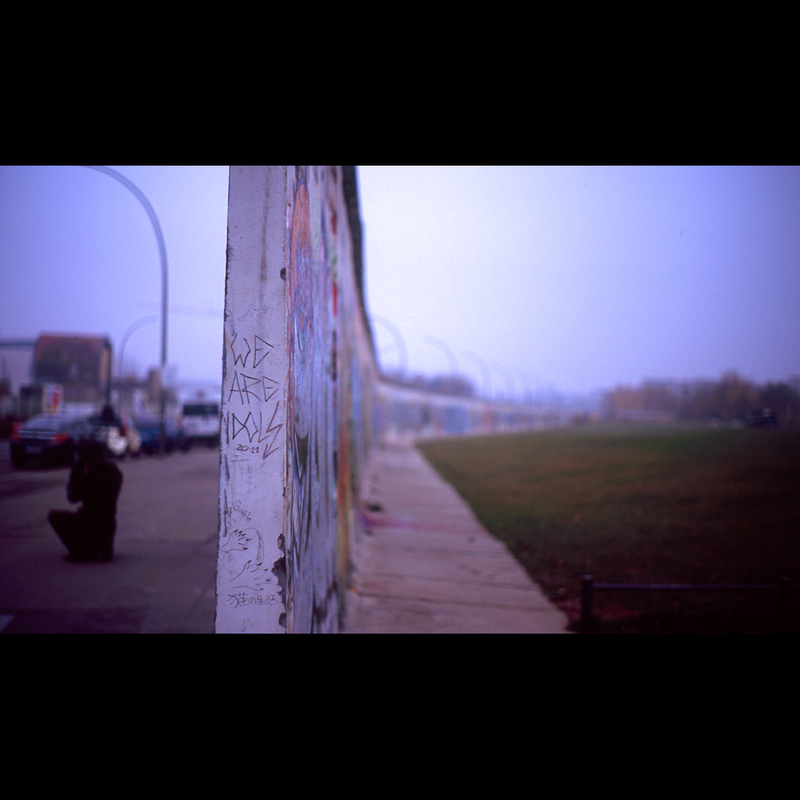 The fall of the Berlin Wall provides a unique “natural experiment” to study this question. In our research we defined the cohort of children born in East Germany between August 1990 (conceived just after the collapse of the wall) and December 1993 as the “children of the wall”. We provide evidence on parental selection based on the average criminal activity of these children as they grew up, their educational attainment and detailed individual-level data on both mother and child, regarding parental skills. Using state-level statistics on contact with the police by age group over the period 1993-2011, we found that the arrest rates of these children were at least 40% higher when compared to older cohorts and to their West German peers. This is true for all types of crime and for both boys and girls. Importantly, these differences in the frequency of contact with the police started appearing as early as six-years-old (Figure 2a). This is despite being part of a numerically smaller group, which is usually associated with positive outcomes and is indicative of a strong negative parental selection; the children of the wall are clearly behaving differently from their peers from a very young age. Similarly, the children of the wall also had worse educational outcomes. Compared to their class peers who were conceived before the fall of the wall, they had lower scores in international tests such as the Progress in International Reading Literacy Study (2001) and PISA (2006), and were over-represented among low achievers. As such, they were 33% more likely to have repeated a grade by age 12, and 9% more likely to have been put into a lower track. To explore if these negative outcomes are driven by differences in parental characteristics, we looked at very detailed survey data from the German Socio Economic Panel (SOEP) – a longitudinal survey of about 11,000 private households in the Federal Republic of Germany from 1984 to 2012, and eastern German states from 1990 to 2012 – and the Deutsches JungedInstitut survey (DJI). 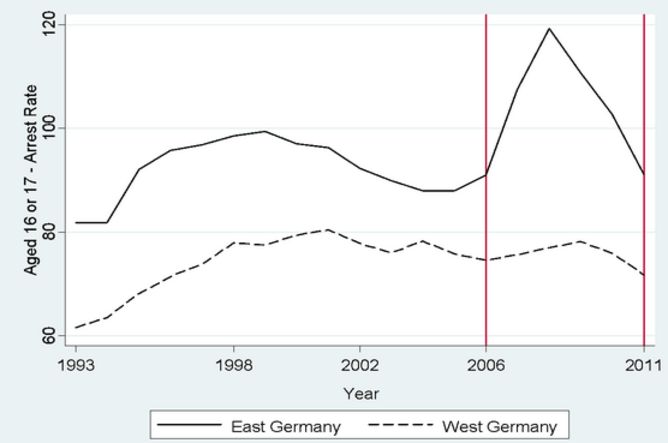 We found that women who gave birth in East Germany just after the end of the communist regime were on average younger, less educated, less likely to be in a relationship and less economically active. Importantly, they also provided less educational input to their children. In these surveys the children of the wall also rated their relationship with their mothers and the quality of parental support they received by the age of 17 much less favourably than their peers. Both children of the wall and their mothers were also more risk-seeking than comparable individuals who were not born in East Germany between August 1990 and December 1993. While these results are in line with negative parental selection, they could also have been driven by biological factors in the timing of their birth: due to the economic turmoil prevalent at the time, these children may have experienced higher levels of maternal stress as a foetus and during early childhood, which may have shaped their future behaviour. To find out more, we examined the same outcomes for the older siblings of the children of the wall. They also similarly reported having a poor relationship with their mothers and lower educational attainment. So this rejected the possibility that the children of the wall had worse outcomes due to being born in “bad times” and we instead concluded that the negative outcomes observed in this group was explained by the lower parenting skills, on average, of those who decided to have children during a period of high economic uncertainty. A possible reason for this negative parental selection is that the fertility decisions of these women were not strongly swayed by changes in economic circumstances. 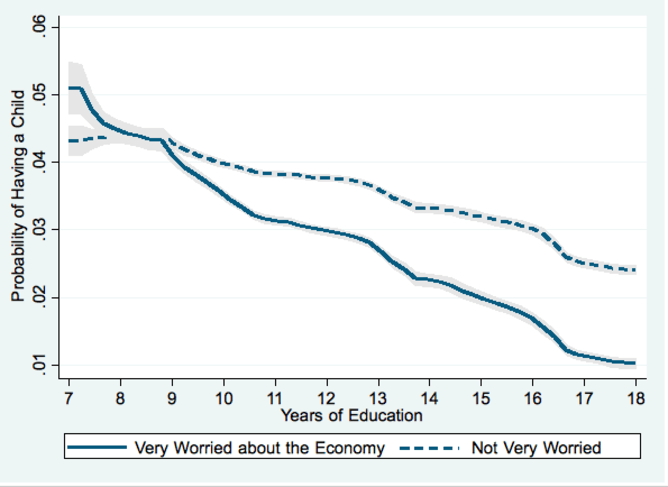 Indeed, further analysis of the SOEP revealed that less educated mothers were far less likely than more educated ones to reduce their fertility when they perceived a bad economic environment (Figure 3). Our findings confirmed that parental selection may be one of the best predictors of the future outcome of a group, and that this most likely works through quality of parenting. These conclusions have potentially important policy implications. First, the provision of public services should not only be based on the size of an incoming group of children – and more attention should be paid on its composition. And second, that interventions need to start from a very young age and should also aim at improving non-cognitive characteristics such as the risk attitude of expecting mothers or children.